Whether your business is online or offline or a mix of the two, building positive word-of-mouth is important to your success. 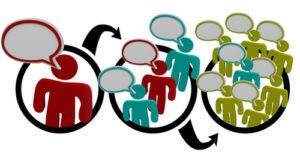 By building a steady following of customers and clients your marketing will become much easier. You may even get to the point where all (or most) of your business comes from word-of-mouth recommendations alone. First, customer service is king. Whether you provide the service yourself or have people doing that task, it’s important to pay a lot of attention to this area. Most customers, even when very upset at a situation, will come around if they are treated politely and fairly. Try to set up a system for your customer service management so that you can follow similar procedures. And always try and diffuse any potential situation by letting the customer know you understand their concerns and will work with them to resolve it. Next, ask for feedback. Your business can only grow from receiving feedback – whether good or bad. It’s all feedback from customers that will help you remedy negative situations and build upon the positive ones. Use this feedback to constantly improve and expand your business. And let your customers know you appreciate them taking the time to provide it. Then, ask for recommendations. Many of your customers, even the happy ones, may not be thinking of passing your information on to friends or family. Let them know that you appreciate being recommended to others and make it easy for them to do so. Have business cards, brochures and flyers available for them to give away. And where possible give people an incentive for passing on your details. It could be a future discount for every friend they recommend or a bonus product. It’s always nice to give back. Lastly, a little more goes a long way. One of the best ways to build stellar word-of-mouth is to over deliver. Whether you provide goods or a service, make sure you do more than everyone else in the field is doing. It’s this small amount of extra effort that will help your business stand out from the competition and help you build a positive reputation and following – a win/win situation for all involved. These are my thoughts, share yours!